Aaron Cooley is the author of the hugely entertaining e-book 'Shaken, Not Stirred', which imagines what might have happened had double agent Dusko Popov schooled James Bond author Ian Fleming in the art of espionage during WW2. A former child actor and Yale graduate, Aaron is also head of development for Joel Schumacher (FALLING DOWN, 1993)'s production company, and is a screenwriter himself. I spoke to Aaron about 'Shaken, Not Stirred' and his love of Fleming and 007. What inspired you to write 'Shaken, Not Stirred'? I had been hired by an independent film company to write an international thriller set in the former Yugoslavia. The movie unfortunately never got made. I was doing my research and stumbled upon the Dusko Popov/ Ian Fleming connection on Wikipedia. Popov went on the talk-show circuit in the '70s to promote his book 'Spy- Counterspy' (1974), and made many hilarious claims, the least improbable being that he was the inspiration for James Bond, after meeting Ian Fleming at a casino baccarat table. Popov also claimed he told J. Edgar Hoover that the Japanese were going to attack Pearl Harbor and that Hoover ignored it. I thought the fictional idea of Popov training Fleming how to be a spy would make a great movie. And a fascination with WW2 had already been instilled in me by my father, whose favourite TV network is The History Channel. But I found the idea hard to sell to studios because there were other Fleming/ WW2-themed movies in development such as one with Leonardo di Caprio producing and possibly playing Fleming himself at Warners, another with Duncan Jones (MOON, 2009) directing, and a BBC mini-series with Dominic Cooper called FLEMING (2013) which has since been made. When the craze for e-books started exploding a couple of years ago, I decided to turn my ideas into a novel instead. Were you worried about legal action from Ian Fleming Publications or Eon Productions? I went to great lengths to avoid legal issues, eg. I changed Fleming and Popov's names. I also did this so I would be able to fictionalise it and have as much fun with the story as I could. I'd like the Fleming and Broccoli families to discover the book themselves. I'd be honoured and touched if they read it, and even more so if they enjoyed it! I had a Twitter exchange with Lucy Fleming recently, but didn't want to be 'that guy' just pushing his book. How did you decide the tone of the book? I decided to write it in the style of how I imagined Fleming exaggerating details and writing reports during the War, or the tone of the Bond films as opposed to the books. The reality is that Fleming and Popov only actually met for about thirty minutes at the baccarat table. I didn't want to write a dark story that looked at Fleming's private life. It would be too depressing. I wanted to write a Bond thriller in the style of the Bond movies that could be enjoyed by fans of the series. The novels are different, even though I love many of them, especially 'From Russia, with Love' (1957). That said, as I wrote I only read Fleming Bond books so that his voice was always in my head. All told, about five years! But I was writing on and off in between my work responsibilities. My boss Joel Schumacher has made three movies in that time! If you added the actual writing and rewriting time up, it would probably be about a year. I spent a good three months researching Fleming and Popov. Probably the best book I read was 'Heisenberg's War - The Secret History of the German Bomb' (2000) by Thomas Parsons. My wife was a great editor. She cut out about a quarter of the book. I had a whole section where Fleming trained at Camp X, the legendary spy school in Canada during WW2, but the first few people who read the book commented that it took too long for Fleming to get onto his mission. I may have to publish that section as a short story someday. Are you planning to write a sequel? I set the ending up so there could be a sequel, but I don't know if and when I will write another Fleming book. I did that half-jokingly as a nod to my favourite part of sitting through the end credits of a Bond film - the card that says 'James Bond Will Return'. Reading Ian McEwan's recent book 'Sweet Tooth' (2012), which is set in the '50s, has made me think even more of doing another Fleming story because my idea for the second book is to set it in the same decade, when Fleming was writing the initial Bond novels. The one after that could take place in the '60s as the first couple of films come out. There's so much great spy stuff you can use as you get into the Cold War. I chose Otto Skorzeny as the vilain in the first book and it would be interesting to bring him back because his later life was very interesting. But I'm actually writing a modern action thriller with a political edge at the moment. I happen to be a political junkie and there were some things I just had to get down on paper. What's the feedback been like from Bond fans and readers? It's been mindblowing so far. There are quite a few five-star reviews on Amazon. I've been surprised by the attention I've gotten from Bond fans and websites. There are things in the book that I thought Bond fans would rip apart but so far it's all been good! The funniest thing that happened was that my father-in-law, who is Dutch and has a lot of relatives in Amsterdam, found out the book had been written up on a Dutch Bond blog and so I had to ask him to translate the review for me so I could understand it! Did Joel Schumacher have any input into the book? When I first pitched the idea as a movie to Joel years ago, he said that we shouldn't do it as we would have to get the Fleming and Broccoli families on our side. Being young and naive, I went off and wrote the book anyway. Once I'd finished writing the book I emailed it to him, and he quickly replied to say he had only read three chapters so far and it was already 'amazing'. It was one of the best emails I've gotten from him. He very nicely gave me that blurb which you can read on the Amazon page for the book where he says I should be nominated for an Oscar! Joel is my biggest supporter. It's not the usual type of movie he makes, but that said he is currently writing a script set in WW2. I don't think I could have written the book if I hadn't learned so much about story structure from working with Joel and rewriting and commenting on hundreds of drafts of scripts for our projects over the years. How long have you been a Bond fan? The first Bond film I saw in a theatre was A VIEW TO A KILL in 1985. After that I caught up with a few more on video. But I absolutely loved the next film, THE LIVING DAYLIGHTS (1987). I still think Timothy Dalton is the most underrated Bond. That film got me obsessed with Bond, and I went off and rented all the other films and read a few of the books. Daniel Craig has got me obsessed again, and CASINO ROYALE (2006) inspired me to go back and read all the Fleming books. That film reinvented the wheel for the series and hit a home run. What fascinates you the most about Fleming? What fascinates me the most about Fleming and other writers like John Le Carre is that they themselves were actually spies in some fashion, although many of them were less on the frontlines than the characters they created. It's also fascinating that Fleming was a young man of privilege who was able to create a character whom all classes could identify with. That says something about Fleming's heart and soul. He was able to take what he knew and turn it into something with worldwide appeal. He knew it wasn't enough to just 'write what you know'. What do you love the most about the character of Bond? I love the fact that Bond is a mystery and that we don't know much about him. It makes you want to create your own background for him. I loved that in SKYFALL (2012) they went into his background but not too much. It was the ultimate tease! 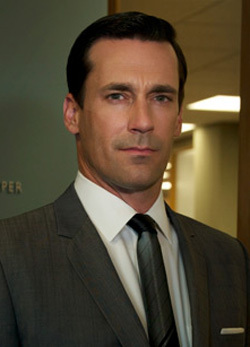 In a way, Bond resembles Don Draper (Jon Hamm) in the TV series 'Mad Men'. SKYFALL was the 'Mad Men' version of a Bond movie. In each season of the show we have a few flashback episodes that reveal a little more about Don. I think that's what future Bond films should do - reveal a little more each time. There's still so much to learn. How did he get recruited? What was his first meeting with M like? What was his first mission? To me the weakest Bond films are the ones where we don't learn anything about Bond. What would you like from the next Bond movie, apart from learning a little more about Bond?I think SKYFALL took the series and Daniel Craig to another level. His first two films were very much the Jason Bourne response. SKYFALL was a pure Bond movie, with a Bond who lives in a very serious world but doesn't take himself too seriously. I'd like Eon to do something structurally that they haven't done before. I liked the rumour of a two-part story, and a cliffhanger ending. It felt like they wanted to do this with CASINO ROYALE, but by the time of QUANTUM OF SOLACE (2008), they abandoned it and Mr. White left the story so early. The succcess of all these inter-connecting Marvel films and several TV series proves that people like serialised stories even more than ever. I'd like the Quantum story to develop further, and for a new Blofeld figure to emerge. That's what kept me renting the Connery films in consecutive order as a kid - I wanted to finally see Blofeld! As regards a director, I suspect they'll go for someone like Stephen Daldry (BILLY ELLIOT, 2000) or Joe Wright (ATONEMENT, 2007) but I'd like to see what an American director could bring to it. I spoke to Aaron by phone on 11th April 2013 and would like to thank him for his time. The Amazon page for 'Shaken, Not Stirred'. The trailer for the book at You Tube.